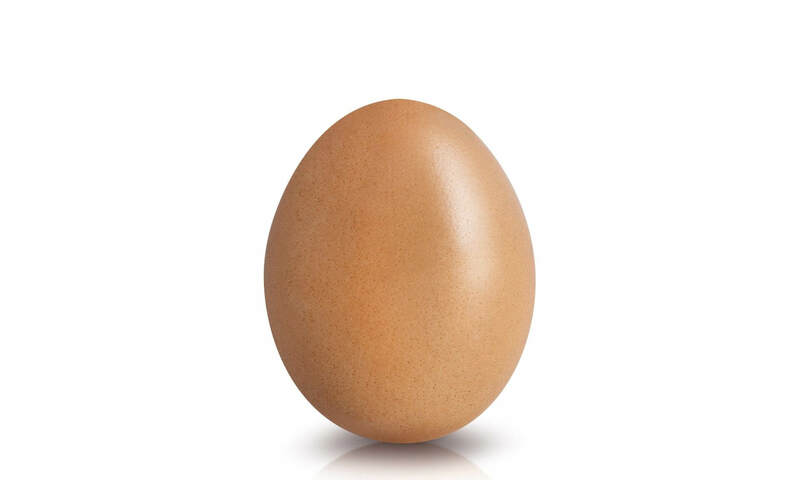 The photo comes from the ‘Egg Gang’ account, aptly named ‘world_record_egg,’ which currently has just one post and 3.1 million followers. The image was posted with the sole aim of beating the previous most-liked Instagram picture: Kylie Jenner’s newborn daughter holding her mother’s finger. Jenner's post also announced the baby’s name—Stormi Webster—and has over 18.3 million likes. "Let’s set a world record together and get the most liked post on Instagram. Beating the current world record held by Kylie Jenner (18 million)! We got this," reads the egg post. It was uploaded on January 4th and beat Jenner's on Sunday when it passed the 18 million mark. According to BuzzFeed News, the account is being run by "Henrietta" — a chicken from the British countryside. "Eugene is my egg," she 'told' the site via email, which must have been awkward to type without fingers. The chicken added that the success came because "the power of the egg is strong." “I saw this as a challenge to beat it. It was nothing personal." Jenner didn’t seem annoyed at being beaten by an egg, responding with a video of her cracking one onto the ground. Unsurprisingly, a number of other accounts have now appeared that are trying to ride the egg’s success, including one that purportedly shows its mother (currently on 47 likes), and another containing some scrambled egg (22 likes). In some social media news that isn’t egg-related, Japanese billionaire Yusaku Maezawa last week posted the most retweeted message on Twitter, though he was offering a near $10,000 incentive to 100 randomly selected people who spread his words. Add another one, and suddenly you're perverse. Go figure. Mentality of a hoard, fickle and non-sensible. Proof there are 28.5 million bored 11 to 16 year old kids who can't leave their phones alone. Humza, veLa, pit1209 and 3 others like this. who thought that this would be a good, original idea? Amazing how the simple things please the simple minded. "Eugene is my egg," she 'told' the site via email, which must have been awkward to type without fingers"
Never heard of people who "hunt and peck"? Well, that answers the age old question of which came first ..... wonder if there are any chicken pictures out there? I wasn't aware chickens could even lay eggs (I thought that was hens), never mind have a solid grasp of the English language. A very under-appreciated species. And a delicious species. Someone with nothing but a single post and no other background, was able to have their tweet (Whatever this was) liked by almost 33 million people (By the tame the post picture was taken), and all you can say are a couple of bad puns about it and calling people simple minded? Geez... are we really in a tech forum? You might find this hard to believe, but I really don't give a damn. Not really sure if you mean the egg or the Instagram in general.